Battery Chargers, Switch Mode Power Supply (SMPS), DC - DC Converter etc. Established in the year 2014, we, "Nuteck Power Solutions Pvt. Ltd.", are one of the leading Manufacturer and Exporter of a comprehensive range of Power Solutions. Our product range comprises of Battery Chargers, Switch Mode Power Supply, Over Voltage Protector, DC-DC Converters, LED Driver, POE Adaptor and much more. We are suppliers to market segments such as Industrial, Medical, Control & Automation, Defence, Power, Railway, Renewable energy, Telecom, etc. We as a team collectively work towards our objective of offering to client’s best range that not only adds to their productivity but also does not give any scope for complaints. Further, the heavy investment on advanced infrastructure unit has also helped us in achieving optimum turnover to meet heavy market demand & our experienced team of industry professionals also guides the organization through all critical phases, thus ensuring greater competence in the offered end products. Today, we take every opportunity to meet the exact requirements of our customers. The suggestions and ideas provided by them are taken seriously and every required feature is incorporated into the manufacturing process so as to deliver them a highly customized range. Here, our concern to serve clients in all possible manners has also helped in enhancing their productivity levels as well as our own capability & knowledge base. We have with us cutting edge Infrastructure facility that is a testimony to our capability and concern to serve clients with products as required by them. The heavy investment done in the advanced manufacturing unit has also helped in yielding expected returns with optimum turnover so as to meet heavy market demands. Here, our team is also at the forefront of guiding the organization through all critical phases. The manufacturing unit featuring maximum installed capacity runs smoothly because of the competent management of our technical team. Further, we also have with us modern Quality and R&D units that allow us to flawlessly design, develop and reassess the quality of our high-end range of transformers and battery chargers. In the era of customer delight, to perform more than the customer expectations, continuous improvements in the quality system are carried out. Furthermore, constant efforts are made to establish the company as a value-adding, strategic and a lifetime supplier. The standard range of Switch Mode Power Supply (SMPS) and battery chargers manufactured by us meets application requirements among clients in industry verticals. As clients need special features and modifications in products for offering critical solutions to their unique requirements, we make every effort to do amendments as well as incorporate desired modifications to match clients' exact specifications. Here, our manufacturing unit also has the capability for seamless adjustment as well as making amendments without causing a discrepancy in the production chain. The efforts made to deliver as per client’s specific requirements have also helped in generating tremendous goodwill among them as well as made us their trusted ally in their enhanced productivity scheme. 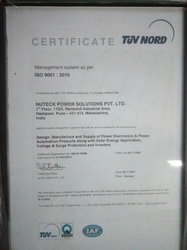 Nuteck Power Solutions P Ltd. is An ISO 9001:2015 certified company. Our business operations are well handled by our team of experts who guide the operations through all its critical phases. Their process expertise also helps us to deliver quality products to our customers in exact specifications as demanded by them. Our clients have expressed their satisfaction with the range of Switch Mode Power Supply (SMPS) and battery chargers as we take every opportunity to meet their exact requirements. Their suggestions & ideas are also taken seriously with every required feature incorporated into the manufacturing process so as to offer better leverage to our customers, thus making us their trusted ally in their enhanced productivity scheme. 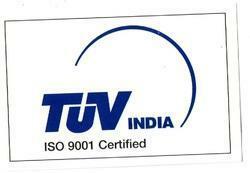 We are manufacturers of High Voltage Power Supplies that set benchmarks for other industry players to follow. We design and manufacture Battery Chargers, Switch Mode Power Supplies (SMPS), AC - DC - Adapters, DC - DC Converters and Over Voltage Protector. Our robust supply chain and dedicated focus to corporate provides confidence about us being a reliable, strategic partner.